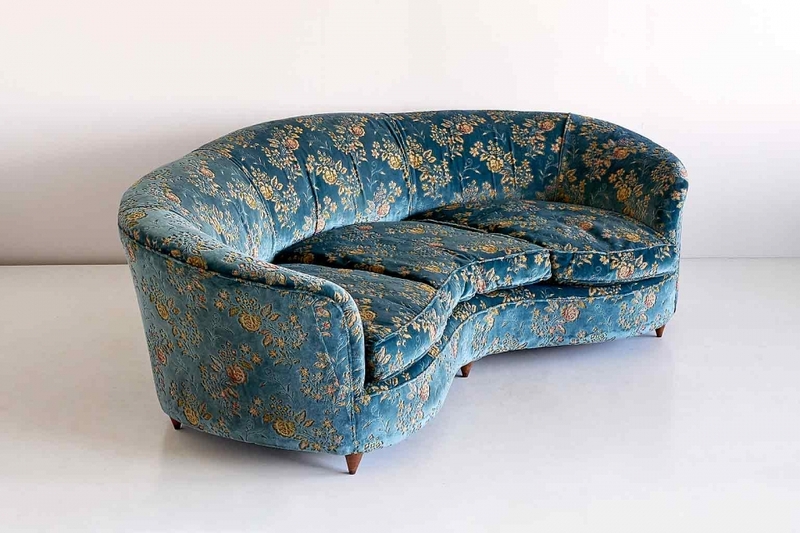 This sumptuous curved sofa was designed and manufactured in Italy in the late 1930s. The design is attributed to Gio Ponti, who has designed similar sofas for the manufacturer Casa e Giardino and the Hotel Bristol in Merano. This elegant sofa originates from a private estate in Milan and may have been a custom design, given the particular measurements. Currently, the design is being researched at the Gio Ponti Archives. The generous dimensions and in particular the seat depth make this a plush and very comfortable design, ideal for lounging. 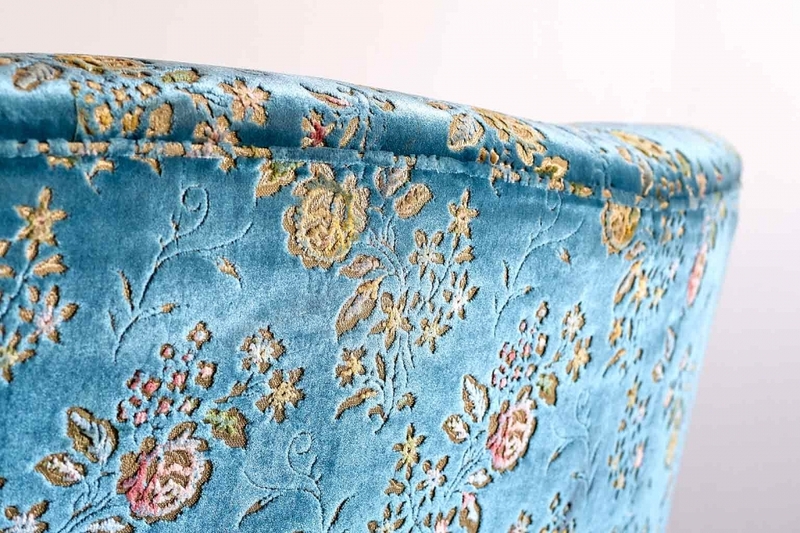 The sofa retains its original high quality upholstery in a blue mohair velvet with a sophisticated embossed floral motif throughout. The six conical legs are executed in solid burl walnut. The sofa is in a reasonably good, fully original condition. The fabric has been preserved well, with some creases mostly on the bottom of the backside. The interior joints of the sofa feel slightly unstable in some places. 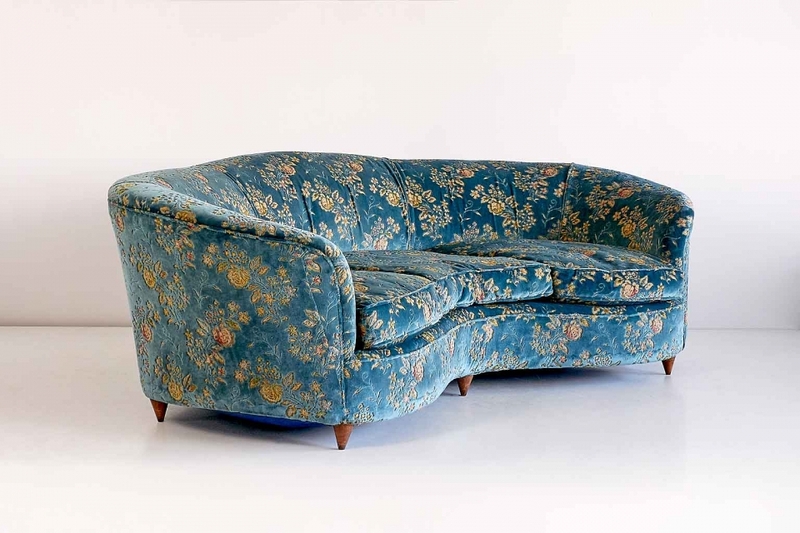 While the sofa is usable as is, we recommend to fully recondition and reupholster the piece in order to improve the stability and overall comfort. Condition: Fair. Wear consistent with age and use. Minor structural damages.